The NSW election is here and our state faces a critical choice. Read our no-nonsense election guide to help you cut through the spin and understand where the parties stand on climate action. Then share this page with as many people as you can so voters know what's at stake when they go to the polls on Saturday. UPDATE: The desperate Berejiklian Government have threatened us with legal action over our election scorecard exposing their shameful lack of action on climate. They can try to distract voters and silence us, but it doesn’t change the facts: they have no credible climate policy a day away from the election. The polls suggest the contest is neck and neck, and with the margins so tight, parties are looking to gain an edge wherever possible. 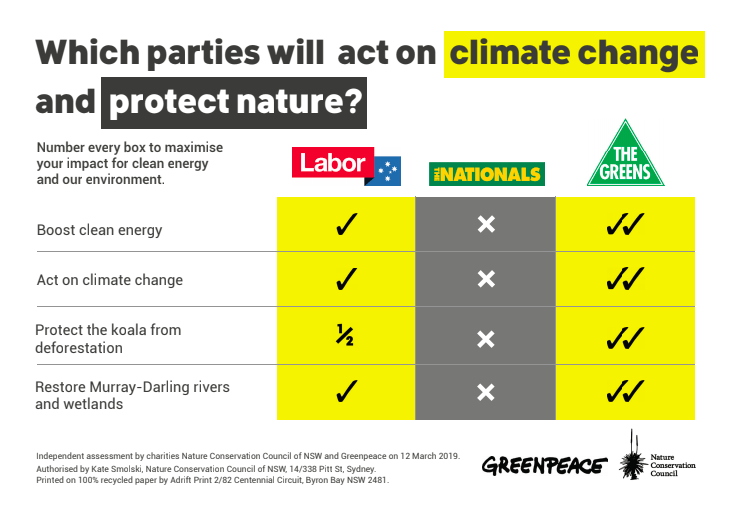 Share Greenpeace’s spin-busting election guide on Facebook so everyone knows exactly where parties stand on climate action when they vote. Not on Facebook? Share this page instead. A number of polls indicate that the environment and climate change are among the top factors that voters will consider when they cast their judgement. 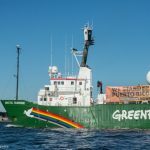 Action on climate change is a vote winner, so it’s somewhat surprising that not all the major players are seeking to exploit this potentially fertile ground. 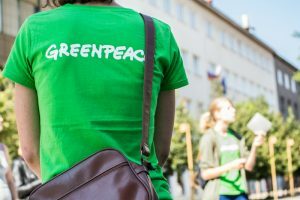 Read on for Greenpeace’s guide to the New South Wales 2019 election! TLDR: A week out from the election and the Berejiklian government still has no climate policy. You read that correctly. In a contest widely dubbed as a “climate election”, the Berejiklian government has no climate policy. 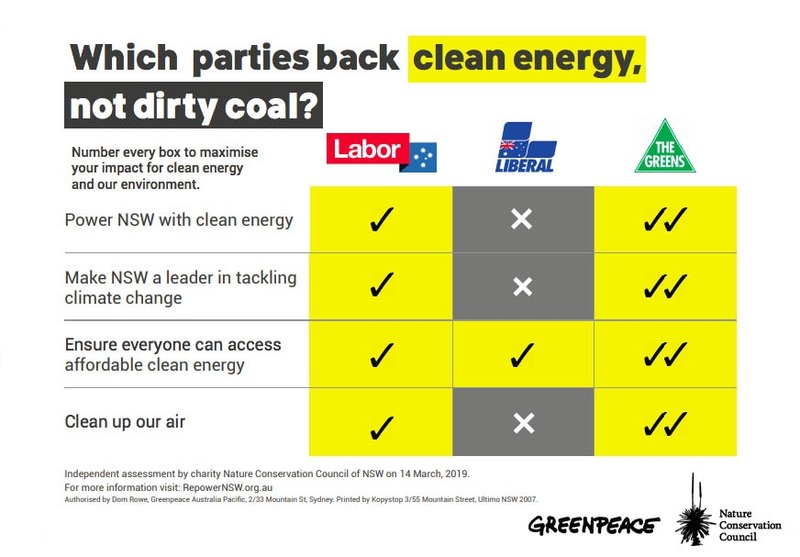 Rather than showing they are different from the rabble in Canberra, Berejiklian’s willfully ignorant and grossly irresponsible government, has shown the coal obsession that plagues the federal Liberal Party is just as strong in New South Wales. The Liberals did announce a couple of policies during the campaign. 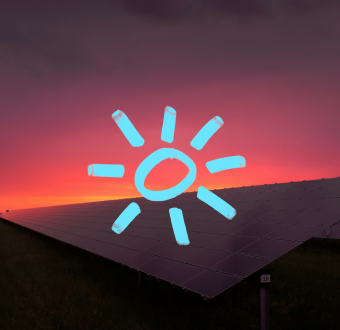 A plan to offer interest free loans so up to 300,000 households can install rooftop solar and battery storage. They also propose to amend strata voting laws to lower the threshold for installing solar panels from 75 percent of voters to 50 percent. That’s literally it. The Liberals like to talk about having a 50 percent net-zero emissions target by 2050 but they have no policies to get there. We know that work on developing such policies had begun under Mike Baird, but they came to a complete halt under Berejiklian. The Premier has personally put climate action on hold, while at the same time ignoring her own climate advisors. It was so bad, they wrote to Berejiklian, saying they had “been rarely engaged and the advice we have given has been largely ignored over the last few years.” The Premier is yet to respond to the letter. TLDR: Labor’s proposed climate change policies would see the biggest investment in renewables in New South Wale’s history. 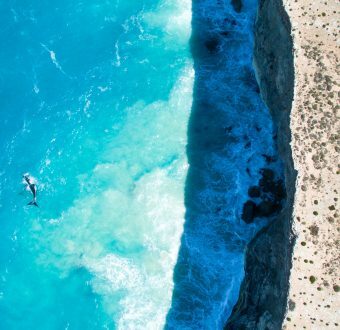 Labor plan to power NSW with 50 percent renewable energy by 2030 and run most of the government’s operations with 100 percent renewables by 2025. Labor’s plan for a 50 percent Renewable Energy Target (RET) will take the state from laggard to leader, putting it in the same league as Victoria and Queensland. It’s a bold vision, led from the top but there is also something for the grassroots. Labor will also offer incentives for rooftop solar. The party has unveiled a plan to offer subsidies of up to $2200 to half-a-million homes to install solar panels to help lower electricity bills. Strategic investment in new clean energy projects, strengthening the grid and large-scale energy storage projects. Competitive tenders for construction of low-cost energy projects including wind and solar. The creation of up to 4000 new jobs for workers to transition away from coal-fired power stations. TLDR: The party that you would expect to be the most progressive in this area has lived up to its name. The Green’s propose a huge raft of policies to transition NSW from a laggard on renewables to a leader. The centrepiece of the Greens’ energy policy is a plan to establish a publicly-owned renewable electricity supplier and retailer called PowerNSW, that will aim to build, distribute and also retail 100 percent renewable electricity for New South Wales residents by 2030. The party also has plans to set up a $5 billion Regional Clean Infrastructure Investment, which will fund four regional renewable hubs in the Murray-Riverina, Northern NSW Tablelands, Central West NSW and Broken Hill. Make sure you think about climate on Saturday when you cast your vote.